Tag line: "Dave Speed is saving the world from crine...but who's saving the world from Dave Speed?" Before I ever watched the Spaghetti Westerns that made him a star (films like They Call Me Trinity and My Name is Nobody), I’d seen actor Terence Hill in Super Fuzz, a 1980 comedy written and directed by Sergio Corbucci that, despite its occasional foray into all-out silliness, remains a harmless bit of fun. At the request of his superior officer, Sgt. Willie Dunlop (Ernest Borgnine), rookie cop Dave Speed (Hill) pays a visit to a Native American reservation, to collect on a past due speeding ticket. Unfortunately, the area had been evacuated some time earlier so that NASA could carry out a top-secret experiment, and before he knows what’s hit him, Officer Speed is caught in a massive explosion when a Red Plutonium rocket is detonated nearby. Instead of being vaporized, Speed develops super-human powers, which he then uses to track down criminals. Like all superheroes, however, Speed does have one weakness: he loses his abilities whenever he sees the color red! Still, Speed remains determined to clean up the city, and along with his new partner Willie Dunlop (who lost his Sergeants stripes for sending Speed into the blast zone), sets his sights on taking down Mr. Torpedo (Marc Lawrence), a local mob boss who’s been churning out counterfeit one-dollar bills. But when an accident leads to tragedy, Officer Speed finds himself on the wrong side of the law, charged with a murder he didn’t commit. Even when I was younger, I knew Super Fuzz was a goofy movie; aside from Borgnine’s somewhat broad portrayal of Willie Dunlop (categorically denying his partner has super powers, even when he witnesses them first-hand), much of the film’s humor is juvenile (in a few scenes, the action is sped up, cartoon style, to make it look as if Speed is running faster than humanly possible). But no matter how ridiculous it gets, I always enjoy the hell out of this movie, which, at times, is genuinely funny (a sequence set on a beach, where Speed is using his powers to control a beach ball, still makes me chuckle), and even with his accent (which can be distracting), Terence Hill is a likable hero, giving Super Fuzz a lead character worth rooting for. 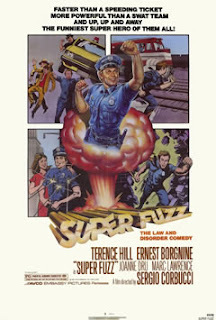 Those of you who didn’t see this film back in the day might have a hard time warming up to it now, but for the rest of us, Super Fuzz is a silly walk down memory lane, and a movie that will always hold a special place in our hearts.